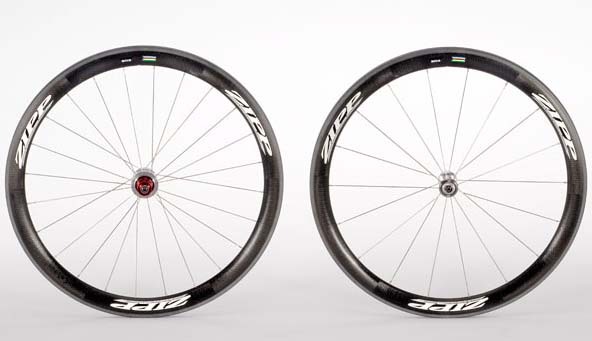 New Product Spotlight: Zipp 303 Cyclocross Tubular Wheels – The Pro’s Choice for 2009? We’ve got a quiver of tubular wheels under test right now, and we’ll be highlighting them on our website in the next few weeks with full reviews after more abuse in later issues of our print mag. Last month we showcased Williams’ new cyclocross tubular wheelset, designed to be an affordable option for most racers. Today, on the opposite end of the spectrum is the Zipp 303 Cyclocross wheel. 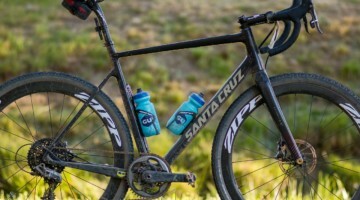 Zipp made headlines at Sea Otter this year with the release of their newly-redesigned 303 tubular wheelset, just in time for the spring classics for their Pro-Tour sponsored teams. And now the company is making more headlines, as the 1209 gram, 303 Cyclocross model will be the new race wheels of choice this season for much of the top domestic cyclocross talent this season, including Todd Wells, Katie Compton and the entire CyclocrossWorld.com team of Tim Johnson, Jeremy Powers, and Jamey Driscoll. While the $2285 price tag puts these wheels out of reach for many racers (let alone starving journalists), we know from our recent poll that the majority of you would buy race wheels over anything else if you found a grand or two on the street. 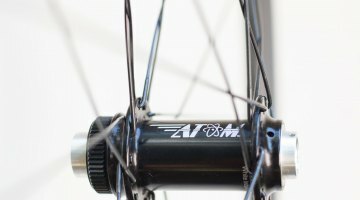 Some of you can afford a high-end race wheelset, and the bike industry thanks you. The rest of us can dream and wait for the inevitable trickle-down of technology or throw the road or mountain bike up on Craigslist to help with a purchase of this magnitude. But what does that $2k+ buy? Let’s take a deeper look. You want details and numbers? Here are some. The new Zipp 303 Cyclocross wheels uses Zipp’s 88 gram front hub paired with Zipp’s 188 gram rear hub, laced with 24 spokes front and rear to the company’s 346 gram, 45 mm deep carbon hoops. It’s this rim that is the big story. 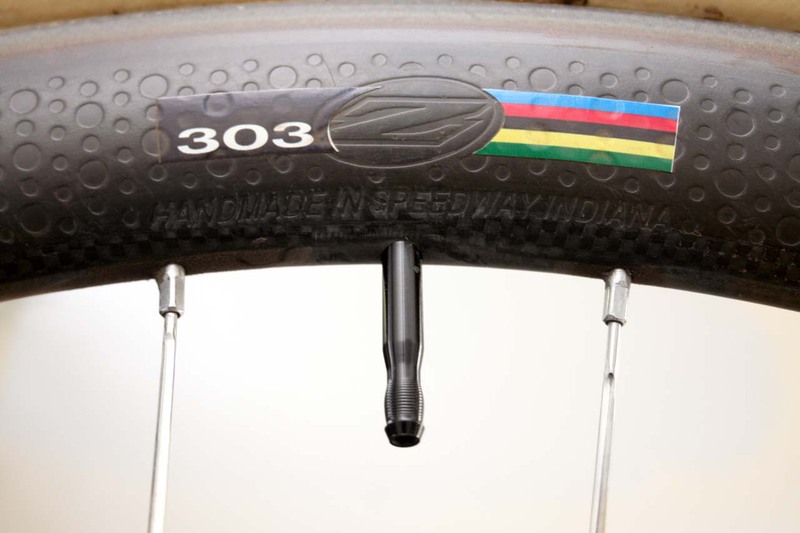 The 303’s rim was completely redesigned for 2009, increasing 23% in width to a fat 27.5 mm at its widest cross section, and increasing 25% (5.1 mm) to 25.4 mm where the tubular tire meets the rim. 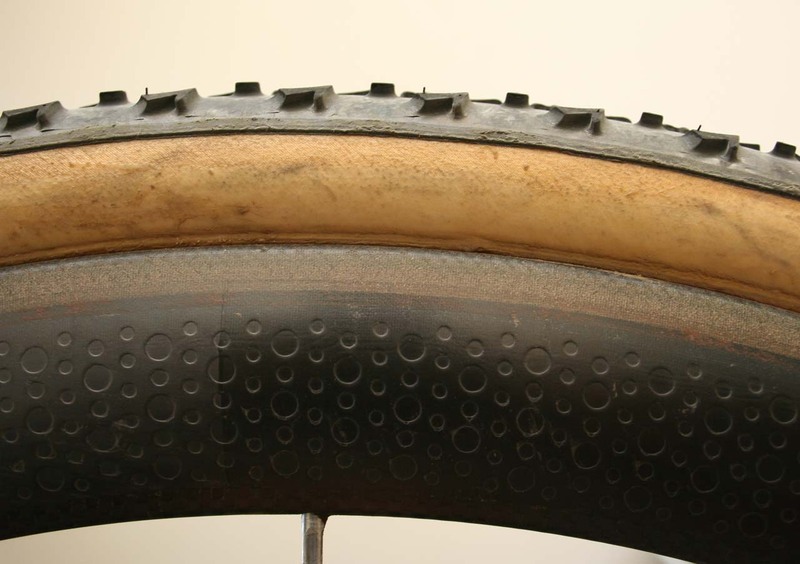 This increase in width was done without an increase in weight over last year’s narrower rim. The wider rim offers better aerodynamics for tires wider than a typical 19 mm time trial tire. 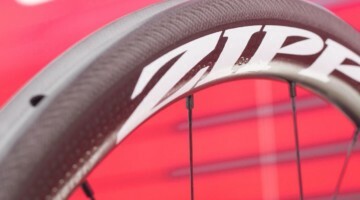 Zipp optimized the rim’s profile to aid in aerodynamics for tires of 21 through 27 mm wide. Why does this matter to a cyclocrosser? Perhaps it doesn’t – most ‘crossers don’t care about aerodynamics at off-road speeds. But if you’re spending over $2k on wheels and are the summer pavement type, they might need to serve double duty as road race wheels and it’s there where the aerodynamic advantages may come in handy. But we’re all here to talk about ‘cross, and the increased width offers ‘crossers benefits as well. 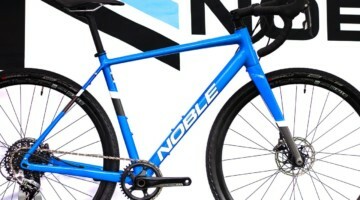 The wider tire bed offer more gluing area and tire support for wide cyclocross tires, which should translate into less tire roll and better cornering. The wider rim cross-section also is relevant, as Zipp redesigned the 303’s rim to offer more vertical compliance over the rough stuff, whether that’s cobbles of Paris Roubaix or your local jungle cross course. Zipp’s Josh Poertner explains that the company’s tests show that the wider, more compliant rim profile can offer up to 2 mm of vertical compliance when things get rough – more than the box rim wheels they also tested. Beyond the wider width, there are a few hidden features that may add to the 303’s desirability as a ‘cross wheelset. The carbon rim does not require carbon-specific pads, allowing for stronger braking and making switching between alloy wheels easier, although you will likely still need to adjust your brakes to accommodate the wider width (compared to normal road wheels). Zipp also increased the effective radius of the edge of the tire bed – from 1.5 mm to 3 mm, and this larger radius results in a blunter edge that should reduce pinch flats, something that’s less common but possible with tubulars, and of course when it does, it’s very expensive and tedious . Lastly, the 303’s rim’s tire bed contains a deep center channel. While not new, the new rim’s center channel is now twice as deep as on prior models, and our initial impression was that this channel might be problematic for gluing due to an increased risk that the center of the tire has insufficient contact with the rim. But Poertner explained to Cyclocross Magazine that this profile was designed to accommodate a tire’s seam and basetape when inflated. “The center channel of the rim was designed by laser scanning actual inflated Vittoria tires and replicating the actual inflated tire basetape geometry,” Poertner said. Marketing fluff or the perfect ‘cross wheel? We’ve recently been testing a pair, and so far, the above claims seem to hold water. In our initial rides at pressures as low as 20 psi, despite bottoming out, we haven’t pinched flatted or rolled a tire, and our glue-only job (without tape) has held securely. And after some rocky trail rides, the wheels have remained true. We’ve risked coloring the braking surface with salmon Kool Stop pads, and after some loud and rough initial braking, things have settled down and become quieter and consistent. As the wheels rotate among our testers, it’s too early to tell on the Zipp 303’s long-term durability. And we haven’t yet experienced true ‘cross weather to push them to their limit. The CXM weather simulation machine is being tuned up, but you can be sure that under the likes of Powers, Compton, Wells and Johnson they’ll see plenty of abuse. Stay tuned for a full review in our print magazine after we’ve gotten more rides on them. Hey Guest, thanks for the comment. Not sure if you saw our last print mag or read the first paragraph above, but wheels like the williams, zipp and others as cheap as $225 are under full review now, and we've had much more affordable wheels with real reviews in the print mag. "We’ve got a quiver of tubular wheels under test right now, and we’ll be highlighting them on our website in the next few weeks with full reviews after more abuse in later issues of our print mag. Last month we showcased Williams’ new cyclocross tubular wheelset, designed to be an affordable option for most racers. Today, on the opposite end of the spectrum is the Zipp 303 Cyclocross wheel." There's no shame in being poor – we are too, so we'd encourage you to post with your profile. When I was searching for the best online store to purchase Wheel Rim, I found this site interesting and the most important thing is that they are offering one year warranty on the used parts also which an added advantage to my pocket. Most of the customers facing the basic problems are of scratches and dents for the wheel. A lot of people believe that scratches and dents won’t harm the motion from the wheel that wasn’t right. It affects. This site allows online for the customers who wish to restore the wheels and rims of their automobiles. This will also avail home delivery for the customers who are concerned. This site will give the perfect solution for all kinds of wheels, tires and rims. For any information please visit to this site http://wheelsrims.net/ .